PRODUCT DESCRIPTION: Dry, odorless, white powder in the boron (boric acid) family with a unique formulation that enables the treatment to last for 1 year or more. Before treatment, vacuum all areas to be treated thoroughly and dispose of bag. Apply only to dry surfaces. Sprinkle directly onto carpeted areas at a rate of 1 lb. per 300 square feet and work into carpet using a hard bristled brush. Any material visible must be brushed into carpet fibers or removed. Also sprinkle under couch cushions and under beds and furniture. Be sure to apply in areas where pets frequently traffic or sleep. Do not vacuum for 2 weeks. This product will no longer be effective if a steam cleaner is used or if the product is allowed to absorb moisture. 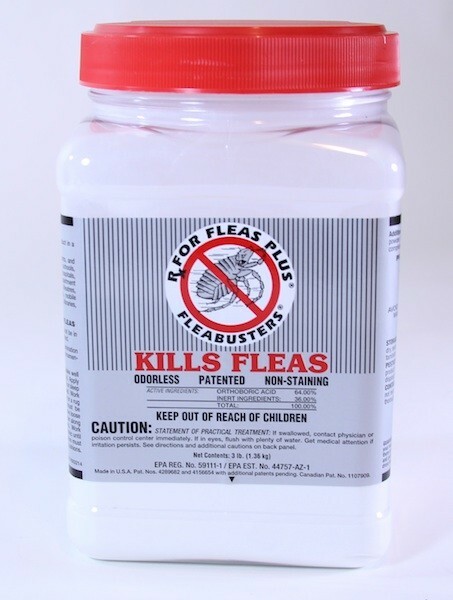 Remember, this product is not intended to kill the adult flea population. It only kills larval stages of the flea which prohibits future adult fleas from emerging. Therefore its important to understand that using this product alone will all the active flea population to continue for several weeks following the initial treatment. So if you have a big adult flea population, consider spraying over the top with PERMETHRIN or PRECOR 2000. Either of these products will effectively reduce the adult populations and in turn, enable the problem to be more manageable. 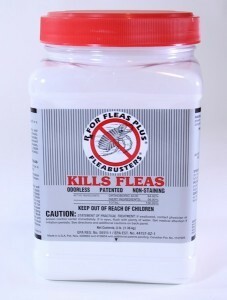 Another way to help get things under control sooner is to set out FLEA TRAPS. WHERE TO USE IT: Carpets, under couch cushions, under beds and other furniture. RATE OF APPLICATION: 1 lb covers up to 300 square feet (3 lb jar treats 900 sq/ft). Should be kept dry and moisture free. I have no carpeting, only tile floors in my home with two cats and one dog. Is it effective for tile floors? Is it safe to leave on tile floors with my two cats and dog who walk/run over the floors? The good news is Precor 2625 is well suited for tiled or hardwood floors. Use it like hair spray to treat the areas. It doesn't take much and one can will cover 1000-1500 sq/ft so it goes a long way. We also strongly recommend setting up some of our flea traps. These will help expedite the process by causing the flea pupae to hatch out sooner and by catching rogue fleas already out and about.